Springbreak is back for 2015! The famous excursion to tropical Beachcomber Island returns this November for another 5 days of partying curated by a massive line up of George FM DJs. Come November 22, chartered Fiji Airways flights will be ferrying over 200 lucky Kiwis to sunny Fiji for a week in paradise. Beachcomber Island will be exclusively booked out for our use, and we’ll have full reign of the resort – there’s no sound control in the middle of the Pacific Ocean. From trips to floating bars to a dance party on a tidal sand bar, there’s something for everyone here. Plan ahead, and lock in Springbreak for this November: the perfect way to wash away those post-winter blues. 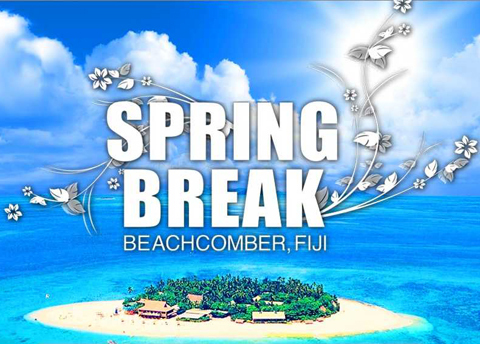 Tickets go on sale Thursday March 12 from springbreakfiji.com or listen to George for your chance to get the jump on everyone else with early access.